Can solar system bodies reflect prime time for seismic events? A MAJOR EARTHQUAKE IN THE MAKING? 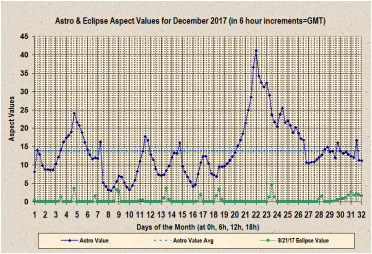 To the left is a graph depicting the strength of astro-aspect values that relate to potential significantly large earthquakes during the month of December 2017. Four months earlier there will be a major solar eclipse casting a shadow over past epicenters of the Great Cascadia Earthquake of 1700, the New Madrid quakes of 1811-12, and the South Carolina quake of 1886. Another damaging earthquake may occur on December 22, 2017 or possibly as early as late October to mid November, 2017.